The Ibero-American summit of heads of state which takes place this week in El Salvador has the theme "Youth and Development." The presence of the summit in El Salvador has brought the focus to El Salvador's refusal to sign the Ibero-American Convention on the Rights of Youth. The Convention, which has already been signed by 18 of the 22 member countries of the Ibero-American Community, contains 44 articles promoting the rights of young people in areas such as health, sexuality, work, education and culture, through the implementation of public policies. For more information, review the text of the Convention (in Spanish) or the related website. Leaders of nations throughout the Spanish-speaking world will attend theIbero-American summit in San Salvador on October 30 and 31. La Prensa Grafica has set up a special page for coverage on its web site. Venezuela's president, Hugo Chavez, who is villified in political advertising by the ruling ARENA party in El Salvador, has declared that he will not attend because the government of El Salvador could not guarantee his safety. As El Salvador approaches elections in early 2009, articles are starting to appear in English language publications on the right and the left. Anytime you come across such an article, you need to figure out the ideological leaning of the publication and factor that into your evaluation. Consider excerpts from these three recent articles. A mix of mistakes by the FMLN and the coming together of previously contesting ARENA factions has cut the difference to just four points, and ARENA leaders express confidence they will overtake the opposing ticket in the weeks ahead. According to United Nations Development Program figures reported in LPG, lack of jobs for youth is an enormous and ongoing problem in El Salvador. Tw of every three youth between the ages of 15 and 24 are underemployed. At a national level, 6.6% of the working population lacks any job at all, compared with a rate of 12.4% among youth. But for underemployment, defined as lacking work sufficient to sustain a dignified life, the rate jumps to 50% among the general population and 62.4% among youth. Ernesto Rivas-Gallont, blogger and former Salvadoran ambassador to the United States, has denounced in his blog the current propaganda which ARENA is using in campaign advertisements. For the past week, ARENA has been running advertisements warning that if the FMLN wins in 2009, family remittances from the US and Temporary Protected Status will be at risk. These were the same lies which ARENA used to some effect in the election campaign of Tony Saca against the FMLN's Schafik Handal in 2004. Rivas-Gallont writes that he has begged US Ambassador Charles Glazer to state publicly that ARENA's propaganda is not true. So far the Ambassador has stated that the US will work with whatever government Salvadorans elect next year. Rivas-Gallont also asks that word of ARENA's lies be spread far and wide, especially in the US, so that "we will inundate cyberspace with righteous protests of this shameful conduct of ARENA." Suchitoto, in the center of the country, and less than an hour from the capital city of San Salvador, is the jewel in the burgeoning tourist crown. Many visitors come for the handicrafts and culture, as well as the town's restaurants and beautiful views of Lake Suchitlan. The Santa Lucia church, blindingly white in the central plaza, is one of the finest examples of colonial architecture in the nation. On three sides of the plaza are covered porticos with cafes, a large hotel, a trendy bar and an Internet coffee shop - the town's first - as well as a daily artisans' market set up under colorful orange tents. A town in El Salvador, once known as much for the killing and upheaval of the country's civil war as for its architectural beauty, is being helped by Ontario's Stratford Shakespeare Festival to become a major new centre for theatre and the arts in Central America. An ambitious program called Sharing a Dream, scheduled to be announced today, will combine the efforts of aid agencies, municipal governments and the festival to export the Canadian repertory theatre company's model to the impoverished El Salvador town of Suchitoto. Tony Saca pledged that El Salvador would keep its troops in Iraq "to finish what we started." The US pledged $2.6 million to help El Salvador's National Police combat gang activity in the country. The Human Rights Ombudsman Oscar Luna issued a report condemning the government for failing to take steps to mitigate flash flooding risks which led to the tragic drowning deaths of more than 30 members of the Elim church when their bus was swept into a river last July. Dell sold its call center in El Salvador to Stream Global Services. Stream is an outsourcing company located in Boston which will continue to operate the call center and preserve the jobs of the bilingual work force. Rating agency Fitch changed its outlook on El Salvador's credit rating to negative citing fiscal pressures and political uncertainty. Today is Blog Action Day 2008, when bloggers all over the world are writing on a single topic. This year the topic is poverty. 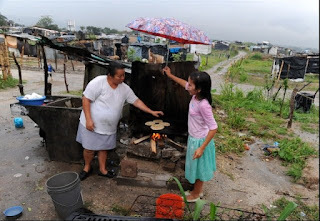 I've written recently about poverty in El Salvador with all the statistics. But statistics often don't move people to action in the same way that pictures and human stories do. So I'd like to revisit again the situation of the marginalized community in Soyapango named "Benediction of God," I first wrote about it in my post Casas de Carton. Salvadoran photographers have documented the difficult lives of the families who live in this community. One example is this essay from photojournalist Jesus Flores titled Life on the Edge in El Salvador. You can also view this photogallery from El Faro titled Sacrificing for a Roof. In all asylum cases, applicants must show they have a well-founded fear of persecution in their homelands. Applicants can seek asylum in different ways: They can apply to Citizenship and Immigration Services, and they can appeal the decisions in court; or, if they are facing deportation, they can appeal to a judge directly in court. Asylum does not guarantee citizenship, and asylum status can be revoked if conditions improve in their homelands or if they commit certain crimes. For Berganza, a 40-year-old floor installer, the fear came early in El Salvador. In her hometown, crowds frequently taunted and threw garbage at a boy they thought was gay. One girl had no friends because people believed she was a lesbian. One of Berganza's aunts received death threats because people thought she was a lesbian. If you want to see how the political parties are presenting themselves to the people of El Salvador through televised campaign ads, you can check out those ads on theiw websites and YouTube channels. You can see more videos at the FMLN web site or at the FMLN video channel on YouTube. You can see more on Ávila's website, RodrigoPresidente.com or on the Rodrigo Ávila video channel on YouTube. The estimated number of Salvadorans who daily leave the country by land and enter the US illegally has declined. The flow of migrants has been reduced from 700 to 400 per day according to Jesús Aguilar, director of CARECEN, and reported in La Prensa Grafica. The reasons for the decline include the worsening US economy, the continuing raids by immigration authorities in the US to detain and deport undocumented immigrants, and increased charges by human smugglers, the "coyotes", from $6000 to $9000. The running mate of Rodrigo Avila in the 2009 elections will be Arturo Zablah it was announced today. Zablah is a former Minister of the Economy and businessman. Last summer Zablah announced his intention to run for president as the candidate of a centrist party coalition, but he was never able to garner the necessary support. Interestingly, in the latest UCA poll, Zablah had one of the lowest approval ratings, lower than Rodrigo Avila, Anna Wilma de Escobar, the current vice president, or Salvador Sánchez Cerén, the FMLN's candidate for vice president. More than half of Salvadorans have little or no trust in the electoral process. More than half of the people believe that there will be fraud in the upcoming elections. A significant percentage of the citizens consider the economy to have worsened under the existing government. The FMLN and Funes maintain their advantage over ARENA and Avila in voters' preferences at the national level.In the poll, Mauricio Funes leads Rodrigo Avila 49.7% to 34.2% for president while the FMLN also leads in preferences for mayors and deputies to the National Assembly, and 58.8% of respondents believe that ARENA should not continue to govern the country. According to a World Food Programme (WFP) study, "Alza de precios, mercados e inseguridad alimentaria y nutricional en Centroamérica" (Price Rises, Markets and Food and Nutritional Security in Central America), more than 100,000 people in this country of 6.5 million slipped below the poverty line between September 2007 and June 2008. The study, carried out among 850 people in 25 rural communities in 10 of the country’s 14 departments, reports that more than one million people in El Salvador, Guatemala, Honduras and Nicaragua fell into poverty in that period. The Inter-American Development Bank (IDB) warned in August that more than 26 million people in Latin America and the Caribbean could fall into extreme poverty if food prices remain high. SHARE FoundationCentro de Intercambio y Solidaridad (CIS)Voices on the BorderUS-El Salvador Sister CitiesCISPESIf there are other organizations planning delegations which are open for applications, please send me an e-mail to let me know and I will add you to the list. El Salvador can little afford to turn away investors. Tax burdens have been lifted and subsidies introduced precisely to attract foreign companies. Strange, then, that the government should be stalling the progress of one of its biggest investors to date. Pacific Rim Mining, a Canadian company that has so far plowed $77m into El Salvador, requested a concession to exploit the El Dorado gold mine in December 2004. Almost four years later, the environment and natural resources ministry is still to give the green light. Fed up with waiting, the multinational miner has put its exploratory activities in the country on hold. El Salvador's Minister of Foreign Affairs, Marisol Argueta, spoke on September 18, 2008 before the conservative American Enterprise Institute in Washington, D.C. You can watch or listen to her remarks at this link. Her speech included a direct appeal for the US to concern itself with the possibility of an FMLN victory in the upcoming elections.